Although gasoline-powered lawn mowers come with their drawbacks, such as increased noise and air pollution, they remain to be the most powerful lawn mowers that you can get. Fueled by gasoline, or a combination of gasoline and oil, these mowers have powerful motors that can make short work of both turf and weeds. However, there are many variations in design and functionality, which often differs depending on how much you’re willing to spend. Below we’ve listed out 5 of the best models available, including our pick of the cheapest for those of you on a budget. 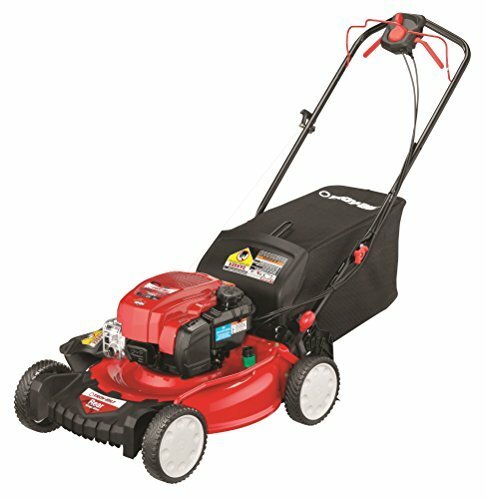 What Makes A Good Gas Lawn Mower? Our pick of the best gas lawn mowers available is the Honda HRX217K5VKA. While it is expensive, this is the best mower we've ever reviewed. It has enough power for every situation, makes a clean cut, and has bulletproof Honda reliability. The class-leading 5 year warranty is icing on the cake. Our runner-up is the Troy-Bilt TB330, which is a rear-drive self-propelled model. It's also available in front-wheel drive with manual start (TB220) or electric start (TB270ES). While they are not a match for the Honda, they do represent great value. Also, Troy-Bilt manufacture these mowers in the USA. If you're looking for a slightly different option, the Remington 22" Trimmer Mower is like an overgrown weed whacker. 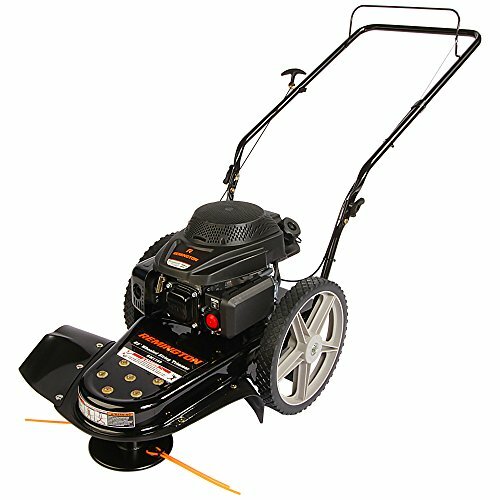 Its unique design allows it to follow uneven lawn edges closely, and lets it cut through weeds better than traditional mowers. It's quite pricey for what it is though, and the small gas tank leads to short running time between refills. If you don't need the power & don't want the extra expense of a gas mower, have a look at our reviews of cordless mowers here, corded electric mowers here, and manual push mowers here. There's no doubt the Honda HRX217K5VKA is an expensive lawn mower, costing around double the price of some of the other mowers on our list. That said, it's easy to see where the justification is for that expense, plus this mower is highly fuel efficient, which somewhat reduces long-term operational costs. As a regular category winner on sites such as Consumer Reports, the powerful 187cc engine is strides ahead of many weaker gasoline engines powering competitor models, and it features rear wheel drive (RWD) and a two-blade cutting system. These design choices immediately place the Honda HRX217K5VKA ahead of other gas-powered mowers without even delving into its other features. Speaking of which, this machine features something called the Versamow system. Versamow allows you fine-tuned control over the amount of grass that is mulched or bagged, through a 10-point toggle that varies the opening between the mower and the grass catcher. Not only is this grass bag generously large, but it also doesn’t slow the mower down thanks to the RWD design of the machine. The mower's 21-inch deck is constructed from NeXite, which is a material known to be incredibly resistant against impacts, which could be caused by stones being chipped upwards by the blades. What’s more, it doesn’t dent, rust or corrode, and is so durable that it has its own warranty. The only complaints that we should make about this mower are as follows. Firstly, there’s no oil filter, so you’ll need to remember to regularly empty out and refill the oil. The system for releasing the grass bag when it needs emptying out is relatively complicated. Those points aside, the only other problem is the price tag, but as we’ve already mentioned, this can be forgiven based on the sheer functionality afforded to you by this beast. The power of the 187cc engine, combined with the rear wheel drive system, means that keeping up with this mower can be a tough task, even in longer grass. That said, Honda's exclusive select drive functionality helps to combat this somewhat, as the speed of the mower can be adjusted to fit with your own stride through a rotatable dial. 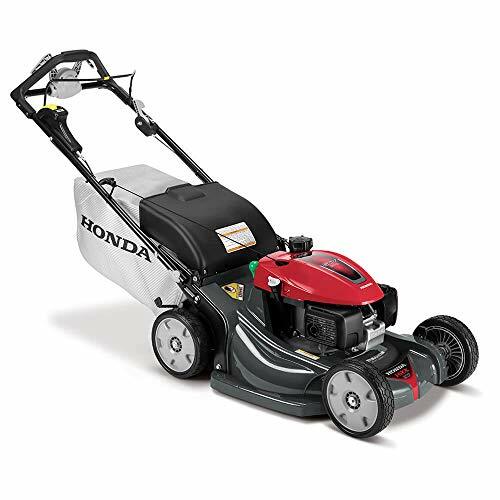 Honda typically provide lengthy warranties on their products, and this mower comes with a 5-year warranty for parts or whole replacement if there are flaws in the design or workmanship. The Troy-Bilt TB330 is powered by a 163cc OHV gasoline-fueled engine, which places it somewhere in the middle of the machines we've looked at, in terms of its cutting power. One prominent feature of the Briggs & Stratton EXi engines, of which this is one, is that you don't need to worry about messy oil changes; simply add new oil when required. Straight out of the box, this mower is incredibly straightforward to assemble in around 5 to 10 minutes at most, even for a beginner. At a heavy weight of 84 pounds, it'll still glide quite easily over flats, but its cumbersome nature will show on hills, as it doesn't have the strongest drive system. Larger back wheels could’ve helped in tackling more uneven terrain. In addition to a rear wheel drive function, other features of this mower include a rake bumper, which helps to elevate grass to an upright position for optimal cutting; a specialized blade for more optimal mulching; a symmetrical deck to aid in more efficient grass flow, and an integrated deck-cleaning system that makes post-session cleaning easier. This mower doesn’t handle hills too well, mostly owing to the average-powered engine, and some patches of thicker grass might require a second pass. The weight can also mean that you tire more quickly during operation. The warranty available on this gas lawn mower is a 3-year limited cover that is typical for a lawn mower, in that it offers coverage for faulty or defective parts and components, or for flaws in workmanship on the behalf of the manufacturer. The product manual contains more information. This Yard Machines mower, with its powerful 159cc gasoline engine, is well-suited to yards of a small to medium size. 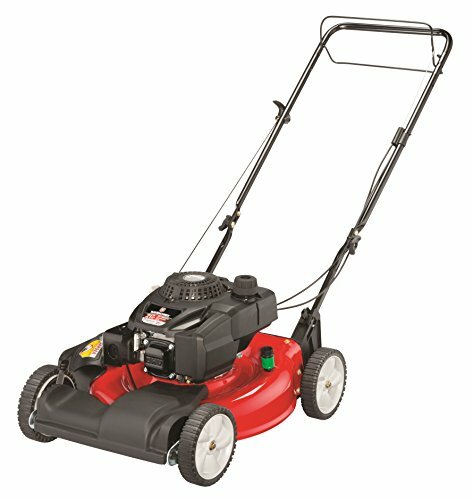 Its front wheel drive mechanism helps to power through grass of varying thickness, whilst a generous 21-inch cutting width can be adjusted to different heights. The mower features a side discharge and mulching function, which dispenses cut grass back onto the lawn. If you're looking for a perfectly trim and tidy lawn once you've finished mowing, then this might not be for you. Unfortunately, the mower lacks a grass catching bag. Though not the lightest lawn mower around, the 72lb frame is quite reasonable for a gasoline-powered machine, and the 8x8-inch wheels help to keep it maneuverable without too much difficulty. It’s also worth mentioning the budget price tag, which coupled with the overly-positive design and functionality aspects, make this our recommended budget mower. Using a 159cc OHV engine, this mower has a unique design and shape, which helps it to adhere to property boundaries alongside fences and garden beds with ease. In the absence of owning a separate lawn edger, this can be extremely useful, or at least cut down the amount of edging required. Out of the box, you'll need around 10 to 15 minutes to get fully setup, filling the engine with oil and locking in the pumps and handle. Oil is included with this mower, which is a nice touch. Though not fired up using a key like some other modern gas mowers, the pull cord does at least have little resistance, which means it’s easy to use for those with less strength. At 78lb, this mower is heavier than some of the other models listed out here, including the Lawn-Boy which comes in nearly 14lb lighter. This makes it a little trickier to maneuver on rough or uneven terrain, although it does tackle weeds with little more effort than grass requires. This Lawn-Boy gasoline mower is started up using a key, as opposed to pulling on a cord, which saves you from straining your arm. It has adjustable speed settings, with an adjustable deck, too. Another great point about the design of this mower is that it's relatively lightweight, at 66lb, making it easy to maneuver around the lawn. 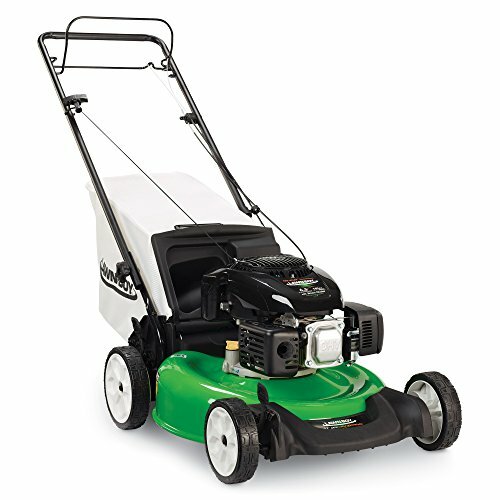 The rear wheel drive system affords you much better traction and control over the mower on hilly terrain, so it's perfectly suited for larger, more diverse lawns. The 2-point 'Height-of-Cut' system is easily adjusted to achieve the perfect cut. There are a couple of small niggles that don’t cause us too much concern. For example, the packaging isn’t ideal, plus the air filter design is quite well hidden, so changing the filter first time around can be tricky. The biggest drawback is a relatively small catch bag, which limits the amount of cutting possible before it needs to be emptied. You should consider the individual size of your lawn, or lawns. Some gas-powered mowers have smaller engines or narrower cutting widths, making them better suited to small- or medium-sized lawns. For larger areas, or more uneven terrain, you'll probably need something with more power or a wider cutting width. For more power, look for an engine with a higher cc rating. There are several features that can make life much easier for everybody who may use the machine. Some mowers come with height-adjustable handles, whilst others feature key-start technology to avoid the need to yank a resistant pull cord. You should consider weight, too. It's no good owning a lawn mower that weighs close to a hundred pounds if you're not able to move it yourself. When it comes to winter, you’re probably going to want to store your mower away for longer periods of disuse. At this point, it might pay to have a mower with a foldable handle, particularly if undercover storage space is limited; you don’t want to leave the machine out in the rain and snow. Also, consider how much effort you want to be putting into maintaining the machine, as some are more straightforward when it comes to draining and refilling the fuel and oil. Regularly inspect the air filter, and either clean or replace it regularly, depending upon the advice for your specific gasoline mower. Gasoline lawn mowers needn’t be a safety concern, though there are some general pieces of advice to follow. For your own personal safety, you should always wear ear protection, as gasoline engines tend to be very loud. You should also aim to avoid directly breathing in the exhaust fumes. For the sake of the environment, you should be sure to responsibly dispose of drained gasoline and oil, as ground contamination can lead to polluted natural water sources. This includes being careful to place a tarp on the ground when draining your machine. Make sure you read the manual that comes with the mower, for any safety information specific to that model. There were no recalls listed for any of the mowers mentioned here at the time of writing (March 2019). However, it's always a good idea to check the latest information at the Consumer Product Safety Commission website before buying any large, expensive or potentially dangerous product. Do you own any of the mowers mentioned here? Did you choose a different one? Let us know in the comments!